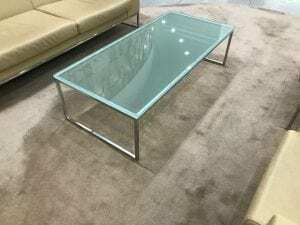 With its neat geometric design, the Boss Design Layla Coffee Table is the perfect companion to the Layla sofa and armchairs (also in stock). Sleek and sophisticated, the table is set on a polished steel frame base with a thick sandblasted glass top and you can take a closer look at this product by clicking on the image that is shown on the left hand side of this page. This product would be ideal for your customer reception area, so if you would like to obtain some further information, including estimated cost and delivery options, you can get in touch with one of our friendly sales team Monday – Friday from 9am – 5pm by calling 07944 508282. If you are viewing our website using a Mobile Device, you can use our Telephone Icon which is located at the bottom right hand side of your screen. Alternatively, if you are unable to call us, you can enter your details into our ‘Request a Quote Online Form‘ shown below and one of our sales team will be in touch to assist you further.